The first ever confirmed image of an exoplanet has been returned by NASA's Hubble Space Telescope. This exoplanet orbits the star Fomalhaut in the constellation Piscis Austrinis. The exoplanet has now been dubbed Fomalhaut B. In the Hubble image below, you can see the Fomalhaut system, with its ring of dust and debris. Inset is an image of the planet taken in 2 different years, showing its apparent motion. Hubble image of Fomalhaut system. Click for larger image. 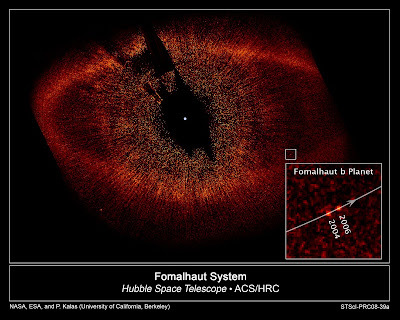 Fomalhaut B is thought to be a gas giant like Jupiter or Saturn in our own Solar system. This planet seems to be much brighter than one would expect, however. Astronomers have theorized that this could be a gigantic ring system much larger than Saturn's. It's possible that the Fomalhaut system is similar to our own Solar system in its youth, hence the giant dust and debris cloud. Remarkably your diary post is sort of tempting. Its jam jam-choked with impressive aboard varied artifact. That I savored supposed to travel your diary post. It happens to be just about exceptional at the click here Cash Advance Regards advanced activity. Continue and to boot relish.